CROSS PLANES: On being a Game Master: 100th Post! So, in the last 30 days I've run 14 game sessions and I won't lie, I'm very tired. But in a good way...mostly. I will say however, that even after 20 years of GMing I still get butterflies before each session. It's not as bad as it was, say 5 years ago, but I have to fight the urge to dominate the evening with small talk or just play a board game. Essentially, I still have stage fright after 20 years! I've begun to look at that anxiety as a strength, however. It reminds me that this game...this shared story...is something important to me and something I share with my players. It's my responsibility to the session and the players all that I have as a GM, every session. To strive to be better...to be the best GM, I can be. You see, I took the stage as a GM, 20 years ago, because I honestly thought I could do it better. I don't mean to sound harsh, but in my first gaming group we had one overworked and underslept GM who did his best, but who's style seemed to be focused on beating us down. Hard. Now, I've grown to understand that he felt that the only way to savor victory was to earn it the hard way, trudging knee deep in a river of defeat and "no, you can't do that." However, I had grown up reading comics and enjoying action blockbusters and to me, being a hero was about valiant deeds and defeating armies and carving your character's name upon the world. It wasn't about getting help from NPC's or not having the right magic weapon or not being high enough level. And since I'd played Champions 4E before AD&D 2E my vocabulary was dominated by "Sure, you can do that, let's build it." Now, was he wrong? Nope. As an aside, I'm sure part of this is because the only "fantasy" I'd read was Thomas and Buscema's Conan the Barbarian, Thomas and Colon's Arak, Son of Thunder, and Mike Grell's The Walord. I had no experience with Burroughs, Howard, Tolkien or Moorcock. Yet. And I appreciate his games far more today than I did then, but I'm still not that kind of GM. Yes, there are things I need to be prepared to say "no" to, but I feel like a failure if I make a player's goals and ambitions secondary to the rules. To me, my role at the table is to provide stimulus for the player's imaginations and a fuel to make that imagination burn brighter and hotter. There is very little in the world to me like that moment when you and your group are all plugged into the same mindscape that you've painted for their mind's eyes. Sure, those moments may be few and far between, but they define me as a GM. They are what I strive for. In fact, they are why I have so much problem using minis and DnD 4E, in particular. Minis and the grid pull me out of immersion immediately. And let me clarify, I can have a great time simply playing with my friends and not let immersion even be a factor. But when I'm a GM, it's what I live for. Last week, when Draco's player came to me and was so connected to his character and had such a strong story arc in mind, it was like Christmas morning coming early. Those are the moments that make me fight through my butterflies. They're the reason I say "yes", so much. I can't thank my players enough because I wouldn't have a game...or 3 of them, without them. It's almost ludicrous that six months ago, I hadn't played more than 2 times a year in close to 4 years. And hadn't run a game even longer. I'd also like to take a moment to complement John Wolfe, a player in the Gatherers (Jacob the Rooster) and the mastermind behind a group that meets in my store every friday for several years, now. I deeply admire his ability to mentor and nurture his players in a way that has amazed me. He molded disparate strangers into a very healthy, very happy gaming group and has the courage to let it mold itself, something I, as a recovering control freak, deeply admire even though it scares the hell out of me. His group loves him and he's earned that love 1000 times over. Oh, and he's a damn fine GM, by the way. 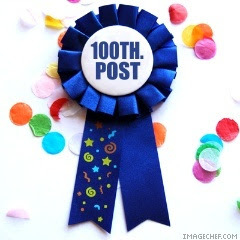 And finally, this is my 100th post. I'm very happy to see my followers grow and can't begin to tell you how much you mean to me. Thank you for reading about my journeys. 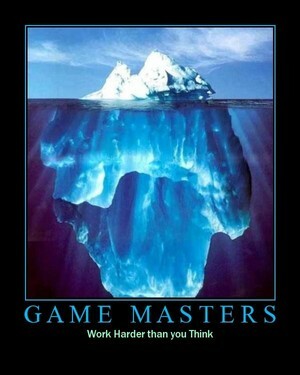 And if you have any thoughts or questions about GameMastering, please feel free to post them! Way to make a (comparatively) new GM worry about the butterflies sticking around for the next five years. Still, I get such a kick out of it, I can't imagine any number of fluttering insects putting me off. Well, I shared in case others had the same problems. We share the same POV, thanks for posting!